The blue of the sky, infinity on the horizon, a supersonic flying machine; a dark night, missile streams spitting fire and mayhem on battlefields – contrary to the expectations of discovering only raw courage and grim grit of a steely heart, the stories in Echoes From The Sky project a panoramic view of myriad events, characters and situations seen from an Air Force Officer’s peripheral vision. Starting from a snapshot of a young cadet in the entirely male dominion of the National Defence Academy who discovers the meaning of motherly care, the narrative moves on to a distant future in which the first lot of young women joining the Air Force as combat pilots today will have matured professionally. Will they find themselves entangled in a web of feminine emotions they thought they had overcome after their baptism by fire in the male bastion? There are pleasant memories that make the soldier smile thinking of all the tomfoolery he indulged in as a greenhorn in the Services. These stories touch many a chord when read by uniformed men and women and will open up a hitherto mysterious world for those in the civvy street. 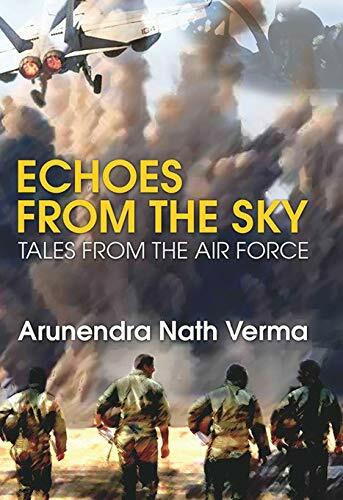 Arunendra Nath Verma was commissioned in the Flying (Navigator) branch of the Indian Air Force in 1965. He has an MBA and an LLB degree, as well as a post graduation in Defence Studies. His first English novel The Loophole won wide acclaim. His articles have appeared in The Times of India, The Indian Express and Deccan Herald. His Hindi short stories, satires and travelogues are regularly published in national Hindi newspapers and reputed literary magazines. His ‘Jo Ghar Phunke Aapnaa’ in Hindi has been widely lauded as a brilliant satirical novel. His other published books include a short story collection Indradhanushi Jaal mein ek Jalpari and Muththi Bhar Sailanipan—a collection of travel stories.